Horseshoe-shaped UFO (unidentified flying object) is a little strange thing in my photo. It looks horseshoe-shaped to me but it depends on the eyes who see. I did not see it during the photography so I do not know if it was moving or hovering. The UFO was captured on photo in Denmark on May 25, 2017, above Odense city at 3.08 pm local time. The unedited but cropped and magnified version above reveals a light-shadow relation pretty clear. It is light on the top and dark on the bottom. And you may see the horseshoe shape too. 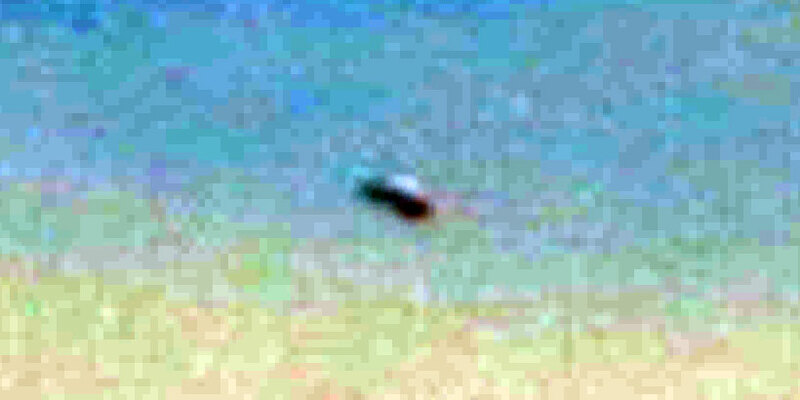 The below picture shows exactly the same horseshoe UFO as above but has been further magnified and processed with Auto Tone in Adobe Photoshop. The exact shape is difficult to see. It looks horseshoe-shaped in rough features but it could also be a flying saucer maybe? The pictures here originates from a photo investigation inside a secluded pasture where I had a creature UFO sighting on May 24. And because of that UFO sighting, I decided to visit the site again on May 25. I had my Canon EOS 60D DSLR camera with me and it produced 173 images and this UFO gallery with 43 hi-res UFO photos. The horseshoe-shaped UFO was not alone but accompanied by other objects in the sky. One spherical object, one unknown shape, and one elongated shape. The elongated shape appears to have white wings exactly as the strange flying creature, I saw the day before the same place. They are all faint objects but they are there. See the original image (see number 3). The horseshoe-shaped UFO appears to stand out relatively clear in relation to the other objects in the above picture. A good example of a horseshoe-shaped UFO would be the footage from supposed South Corea. If the footage is real I can´t say, but it looks real to me. It is an interesting object that rotates inflight which causes incredible patterns for the observer. The video above should be the raw footage featuring the horseshoe-shaped UFO spotted over Busan, South Korea. The unidentified flying object is seen accelerating and at the end of the video traveling at incredibly fast speed.